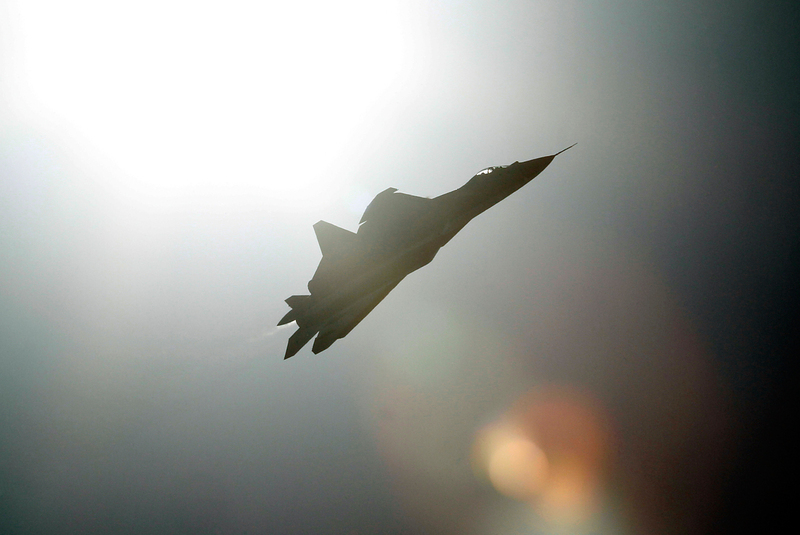 A Sukhoi T-50 flies during a display at the opening of the MAKS International Aviation and Space Salon at Zhukovsky airport outside Moscow on Aug. 17, 2011. The T-50 is a joint project between Russia and India. The new fighter aircraft will receive high-explosive and space-detonating bombs, as well as a 30-mm gun. According to Russian military experts, there are still a number of problems that need to be solved by the designers. Russian designers have published a video showing tests of a 30-mm NNPU-50 gun for the new fifth-generation T-50 fighter, also known as the PAK FA advanced frontline aircraft system. The composition of the firing unit consists of the 9-A1-4071K gun, one of the lightest in its class, which is designed to defeat armored vehicles or armored enemy targets. In the course of one flight the pilot can fire up to 150 projectiles from this 30-mm gun. The new weapon is a modified version of the GSh-301 single-barrel aircraft cannon used by Russian fighters and bombers. The future fifth-generation T-50 fighter will also receive high-explosive and fuel–air explosive bombs, said Sergei Rusakov, CEO of munitions manufacturer Tehmash Group, on Sept. 22. According to him, for the PAK FA the high-explosive OFZAB-500 incendiary aerial bomb and ODAB-500PMV space-detonating bomb, which are used in Russia’s Syrian campaign, are currently under consideration. Manufacturers have already produced a batch of warheads for future tests. As part of its army rearmament program, Russia will receive a batch of 12 T-50 fighters by the end of 2016. The new contract for the supply of a fifth-generation aircraft will be discussed with the Ministry of Defense of the Russian Federation at the end of the year, after which the military department will determine the required number of new aircraft. The new aircraft still has a number of problems. In the first few years after its adoption the T-50 will be brought in line with the generally accepted principles and characteristics of fifth-generation fighter aircraft, said Dmitry Safonov, military correspondent for the Izvestiya newspaper. "There are still no fifth-generation ‘Type 30’ engines. The T-50 will go onto the conveyor with the motors used by the Su-35s 4 ++ generation. They don’t yet provide the weight/traction/fuel consumption balance of the fifth-generation fighter, despite their ability to develop a supersonic cruising speed,” said Safonov. The new Russian fighter was designed as the main competitor to the F-22 Raptor. The American plane has been in service with the U.S. air force for more than five years and has already been used by the military in the skies over Iraq. Russia’s arms producers have not revealed the cost of the work on the creation of the T-50, but it is known to be cheaper than its sole global counterpart. "The T-50 will become part of the series much later than the ‘American’,” said Vadim Kozyulin, professor at the Academy of Military Sciences. “This allows all the pros and cons of the existing machines to be considered and taken into account when creating our aircraft,” he told RBTH. Kozyulin explained that a similar situation occurred during work on the multi-purpose fourth-generation Su-27 fighter: the prototype of the Russian plane came much later than the American F-16 and took into account the problems with the latter. Due to this, the Su-27 has been able to outdo the American jet in its combat characteristics, he said. Kozyulin noted that the T-50 is able to use the full range of existing high-precision air-to-air missiles, as well as all targeted bombs.